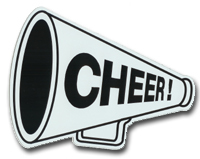 Buy Magnetic Cheer Megaphone Car Magnets.We can also make Custom Cheer Car Magnets for your team, school or cheerleading fundraiser. This 6” magnetic Cheer Megaphone is manufactured and printed in the USA. We print on premium quality, super-thick (.030) magnetic material with top quality, UV protected inks. Be sure to remove, clean and reposition your magnet weekly.